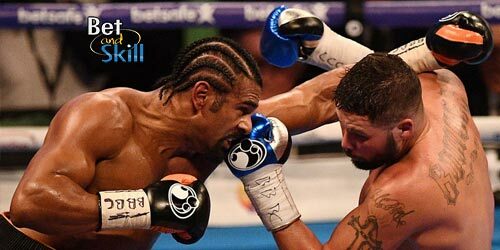 Former heavyweight champion David Haye and WBC cruiserweight champion Tony Bellew collide at the O2 Arena in London in a much anticipated fight on Saturday night. Who will leave the ring with the bragging rights? 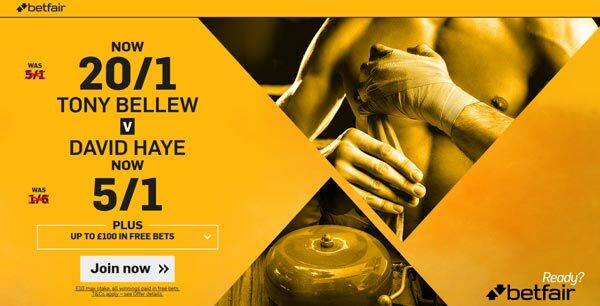 This article contains our David Haye v Tony Bellew betting preview, with free predictions, tips, best odds, bookie offers and no deposit free bets on the fight! Since his return on the ring, David Haye (28-2 26KO’s) has won both his fights against poor opposition. His bouts against Mark de Mori and Arnold Gjergjaj lasted a combined 6 minutes and 46 seconds, meaning that he has only completed one full round of action since 2012. How his body and stamina will hold up if he goes beyond a couple of rounds? David Haye has dismissed concerns about his fitness, revealing he had been to Munich, but only for a routine physical with his doctor. The Hayemaker has not been tested since ending his retirement in 2016 but he made his name through his right hand and has a 90 per cent plus knockout rate in his 28 wins. Haye has a superior strength and this fight could be all over once the first big shot lands given that Tony Bellew has been dropped on numerous occasions by less powerful opponents. Following the 2013 defeat at the hands of Adonis Stevenson, Tony Bellew (28-2-1 18KO’s) moved up to cruiserweight where he has won eight fights on the spin, including the fight of his life against Ilunga Makabu at his beloved Goodison Park in May last year, stopping the Congolese southpaw in 3 rounds. Bellew is not a natural heavyweight and has never fought at this weight. The "Bomber" has never faced anyone as big as Haye before and was badly knocked out by WBC light-heavyweight champion Adonis Stevenson, a man who weighs a good 50lb less than the Hayemaker. Furthermore, Bellew has a habit of taking too many punches which was evident even in his victories over Ilunga Makabu and BJ Flores and nobody knows how Bellew will cope when he takes a full-bodied shot from Haye. Bellew’s best chance at victory seems to be to take Haye into the latter rounds as he is in the better form and by far the sharper fighter. HOW TO WATCH DAVID HAYE v TONY BELLEW FOR FREE! 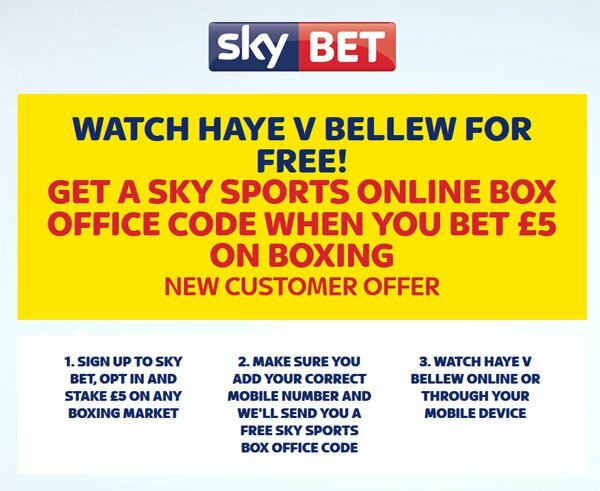 New Sky Bet customers that stake £5 on boxing will be able to watch the Haye v Bellew PPV fight for free online! 7) Follow the on screen instructions and then enter the promo code we send you through text message to complete the booking. 7) You can now watch the event ONLINE at www.skysports.com/boxofficelive or through your mobile/tablet device by downloading the Sky Sports Box Office app or on your NOW TV box. 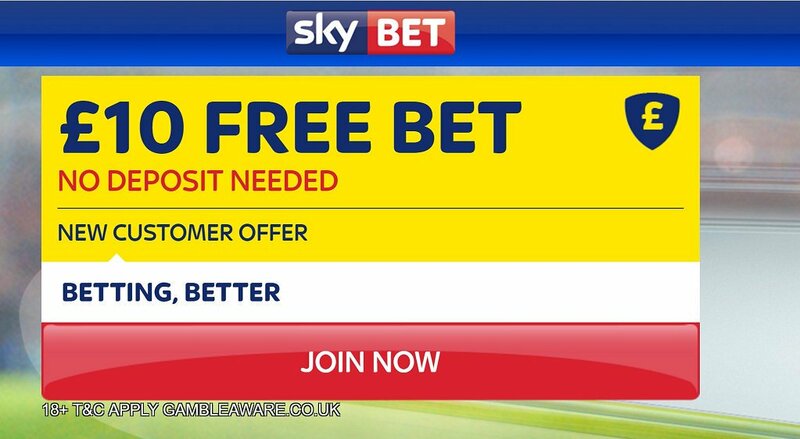 "Haye v Bellew betting tips, predictions, odds and free bets (Boxing - 4.3.2017)"